We deliver to anyone living with a current diagnosis of a life-threatening illness such as cancer, HIV/AIDS, end stage renal disease, congestive heart failure, multiple sclerosis, or another such illness and documented difficulty preparing or accessing healthy meals due to illness treatment, side effects, ambulation difficulties, or another disability. We do not qualify people based on age or income. The majority of our deliveries include seven frozen entrees. We do our best to also include sides of soup, bread, milk, fruit, and a small dessert or two. If you are underweight you may also qualify to receive breakfast. In Denver, we deliver every Friday and Saturday. Your delivery date and time are determined by your address. Someone must be home to accept the delivery. In Colorado Springs, we deliver every Saturday between 10am and 12:30pm Someone must be home to accept the delivery. If you qualify for hot meal delivery in Capitol Hill in Denver, we deliver Monday through Friday between 11am and 1pm. We serve a 640-square mile region of metropolitan Denver (view the map). All of our deliveries are within the E-470/C-470 loop border and west into Golden. We also serve a 164-square mile region in Colorado Springs (view the map). If you live outside of these boundaries, you can make alternate delivery arrangements such as picking up your meals at Project Angel Heart or setting up delivery to a friend or family member who lives within the boundaries. All of our meals are delivered by a dedicated team of volunteers. 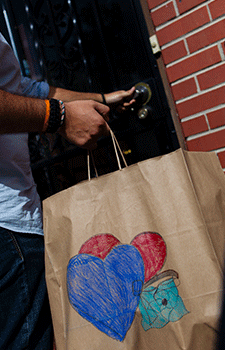 We deliver to more than 1,200 people each week. To learn more about how to volunteer, click here. If you have questions about deliveries, please call a member of our Client Services team at 303.830.0202 or 800.381.5612.